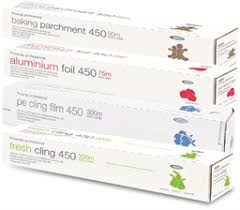 18″ Cling film in a handy Cutterbox, ideal for use in kitchens. 300m in length, suitable for use in micorwave ovens. The Cutterbox is fitted with non-slip feet for stability. Low migration film. The cutter blade can be safely concealed when not in use.